The system does not currently handle the sale of subscription and non-subscription items at the same time when all of them require shipping and handling. This is due to the challenges of splitting shipping charges and taxes among the one-time sale and recurring billing profile. This limitation might be removed in the future. 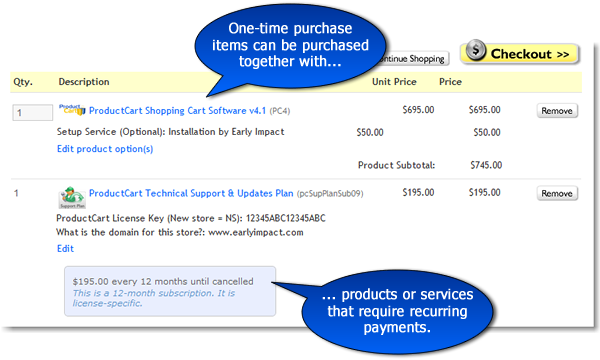 When a subscription package is associated with additional features, those would typically be presented as product options in the ProductCart store catalog. This, however, cannot currently be done in the SubscriptionBridge - ProductCart integration. Our recommended approach is to present those features on the product details page or on a category page (long category description) and indicate to the customer that they will be able to add them to the subscription after they have subscribed to the product/service, by editing the subscription.